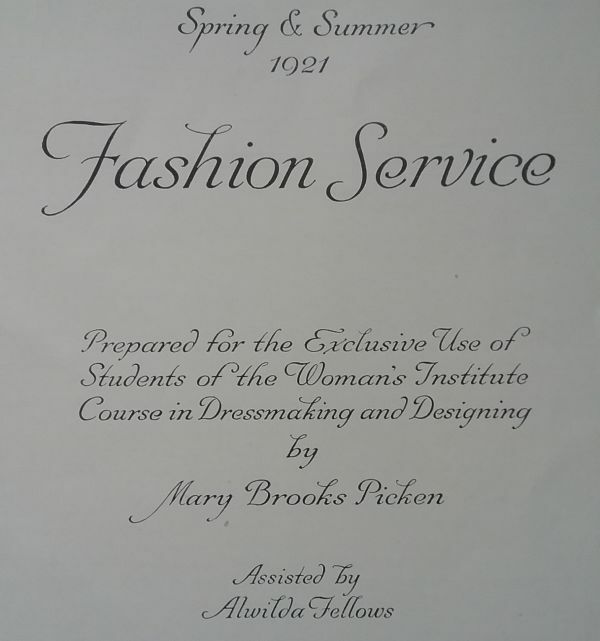 If you are into vintage sewing or the history of home sewing, it’s pretty much assured that you’ve run across Mary Brooks Picken at some point. In addition to the many books she wrote on sewing and dress, she started the Woman’s Institute of Domestic Arts and Sciences in 1916. Woman’s Institute was a mail-order school, and at its peak in the 1920s, there were close to 300,000 women enrolled. The lessons were mailed to each student, who then had to pass a test before progressing. Some of the lessons required that the student submit a sample of sewn work. Students could submit questions about a lesson by mail and get a reply from one of the teachers. 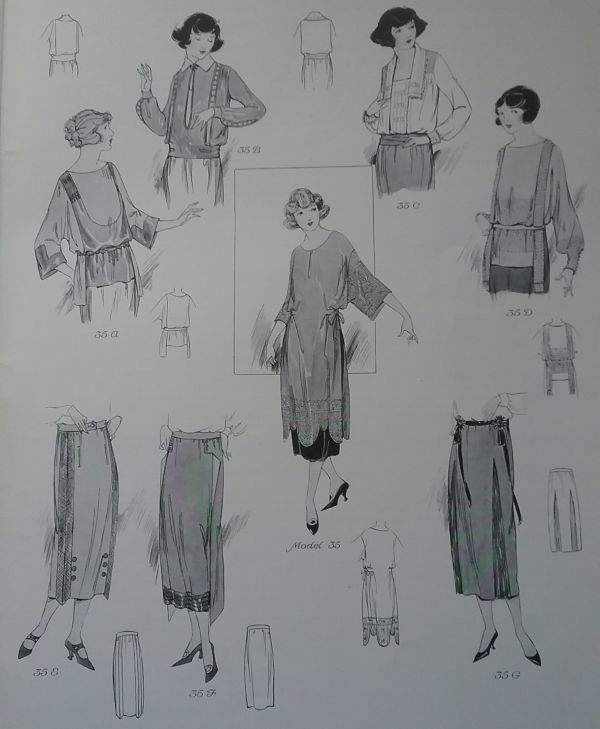 When I was in home ec class in the early 1970s, learning to sew actually meant learning to produce a garment by following the directions in a commercial pattern. Through the Woman’s Institute, students were taught to make a garment by following the directions for cutting, and by draping the fabric on the body. It was a very skilled process, more in line with what students in a design curriculum learn today. 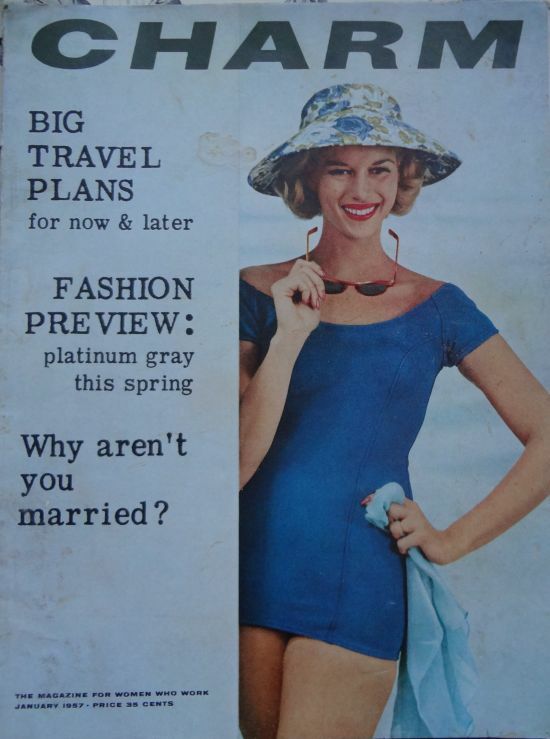 Every student taking the dressmaking class got a magazine called Fashion Service. At first it was sent twice a year, but by the mid 1920s it became a monthly publication. Fashion Service gave advice and instruction on the latest styles, sort of an update to the regular lessons. 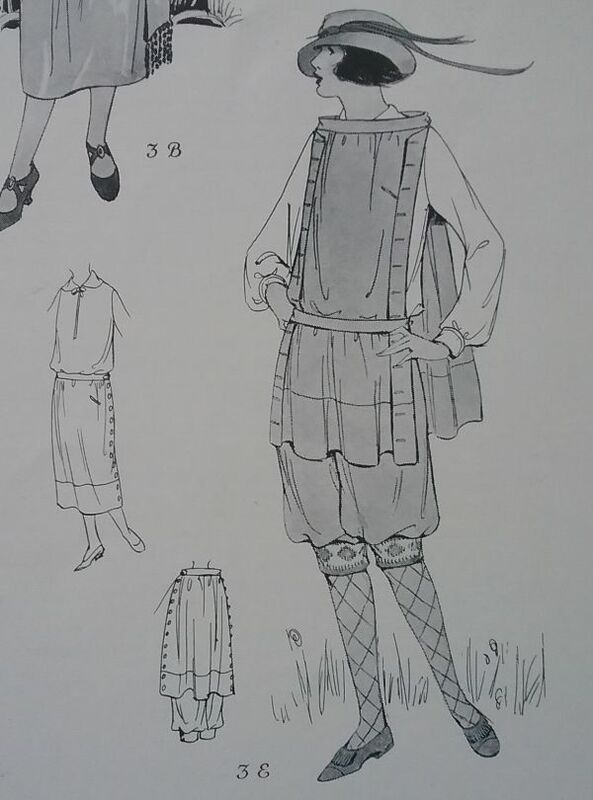 Last week I was lucky to find some issues of Fashion Service in a nearby antique mall. 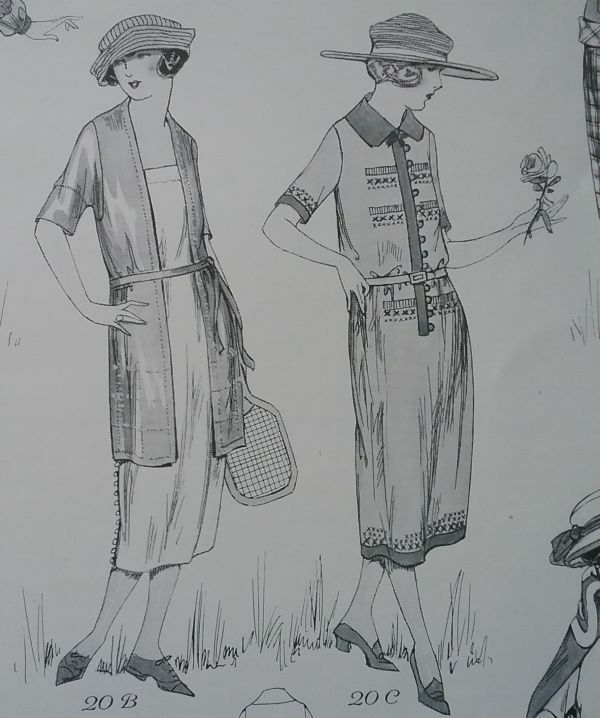 The magazine was divided into themes, like sports dress, tunic dress, one piece dress, and after 1923, the one hour dress. 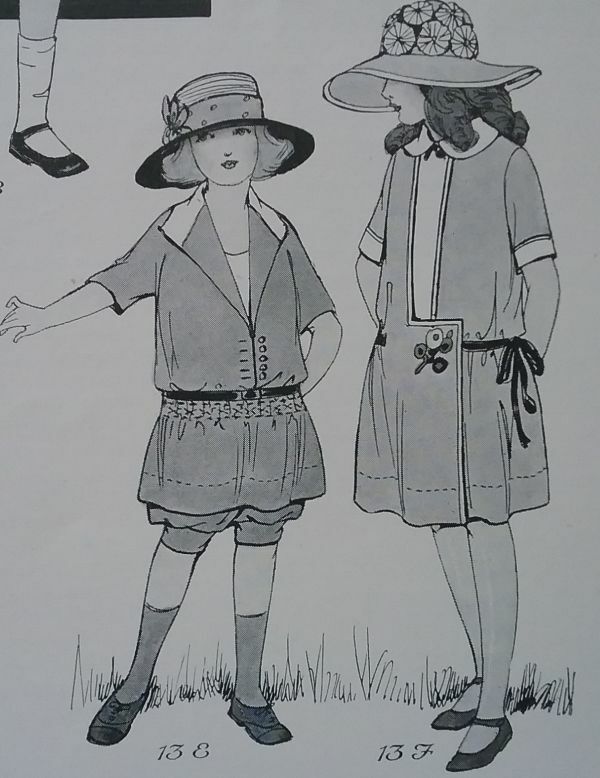 These two dresses from 1921 are sports dresses. On the adjacent page were Picken’s instructions for making each design. 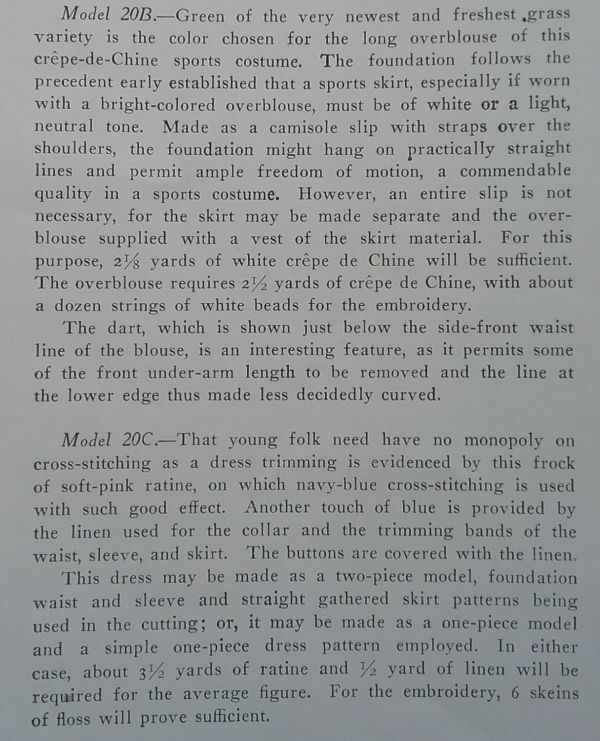 This looks a bit sparce, but each student had to rely on what she’d learned from her lessons, and there was another full page of general instructions for making the sports dress. 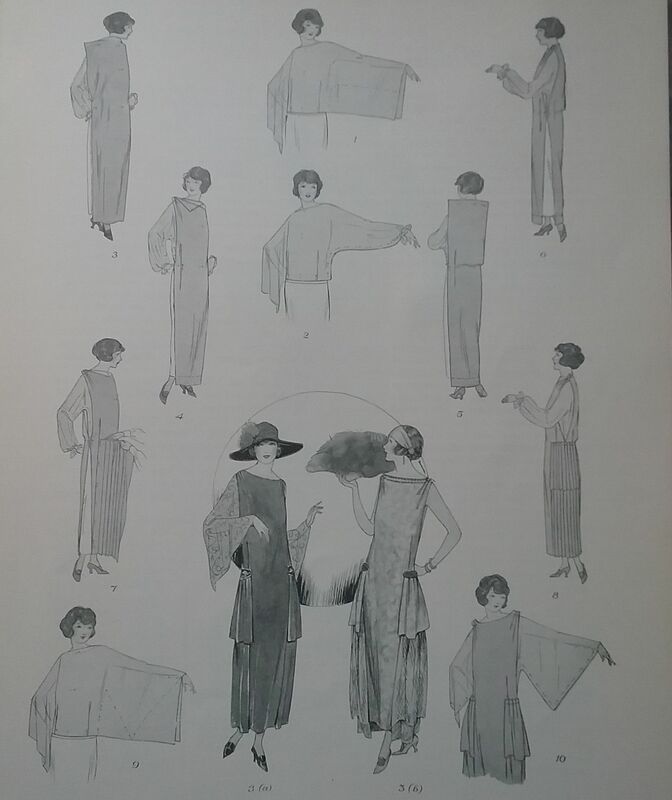 And some styles were given a full page of illustrations to show how to drape the dress. And don’t think that the designs were all very simple. It seems that no design was too complicated for the Woman’s Institute student. Most of the garments featured were dresses, but most issues also had a page of blouses and skirts, a page of coats, and a few pages of clothes for the children. Absent was instruction in lingerie and bathing suits. 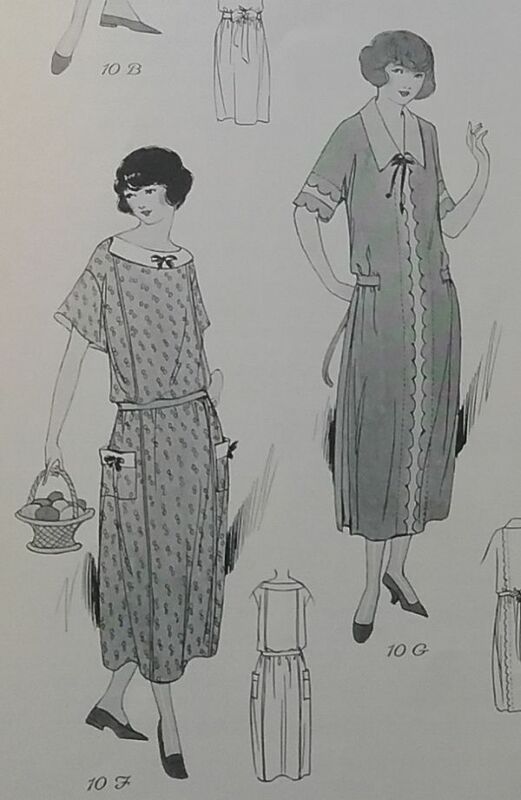 Picken knew her students, so each issue also had a page of what she called “home dresses”. Somehow that just sounds better than “house dress”, I think. 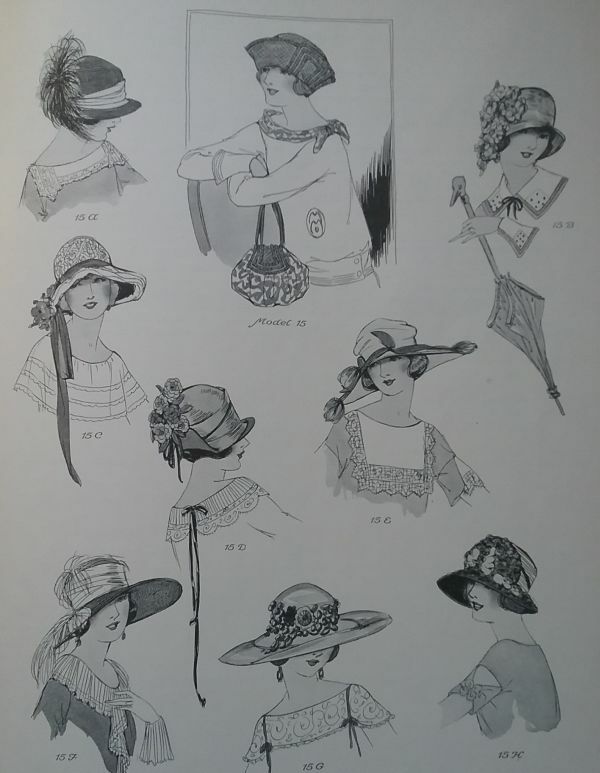 Millinery was covered in a separate course, but Fashion Service usually had a page or two on the latest in hats. 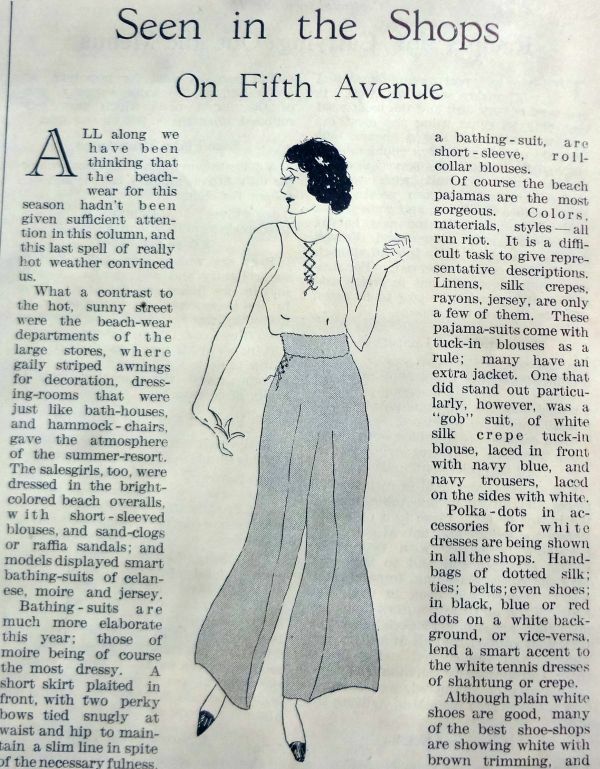 but in the seven issues I have ranging from 1921 to 1924, there was only one design for women that featured pants. 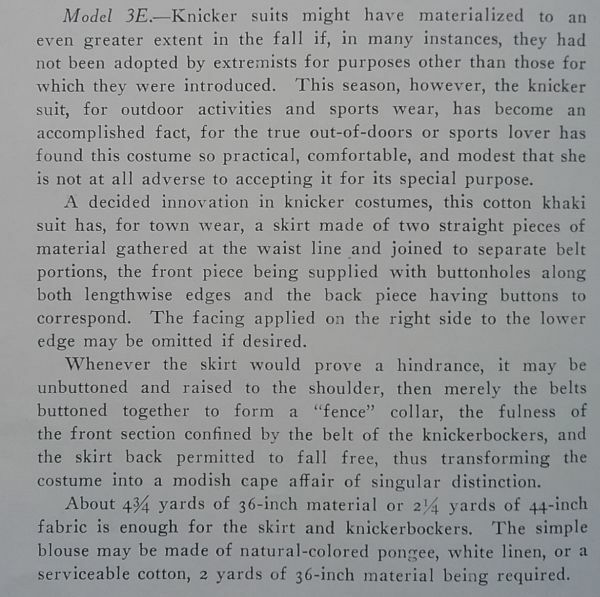 This knickers set looks a bit odd at first glance, but the tunic in the large illustration is actually the skirt that was “for town wear.” This was probably an improvement over the idea of mountaineer Annie Peck, who in 1901 suggested that a skirt worn in town could be “left under a rock” when on the trail. I can imagine that to the average Charm reader, a trip to somewhere in which a swimsuit would be needed in January was just a dream. It was, after all, The Magazine for Women Who Work, and not for the women who had large sums of money with which to take winter vacations. Or maybe this was meant to be for the “later” mentioned in the caption. I’m really interested in the idea of swimsuits with sleeves. Ever since the sleeves were banished from bathing suits in the early 1920s, makers have tried on numerous occasions to bring them back, and in fact, many of Claire McCardell’s designs for swimsuits had sleeves. Nevertheless, it is very rare for one to come onto the vintage market, so I’m betting they just didn’t go over, especially in the days when much of the object of wearing one was to get a tan. Today everything from two pieces of string tied strategically to a long sleeved leotard paired with leggings can pass for a bathing suit. I rather like the idea of a short sleeved bathing suit, but then I’m pretty much in favor of all sleeves these days. 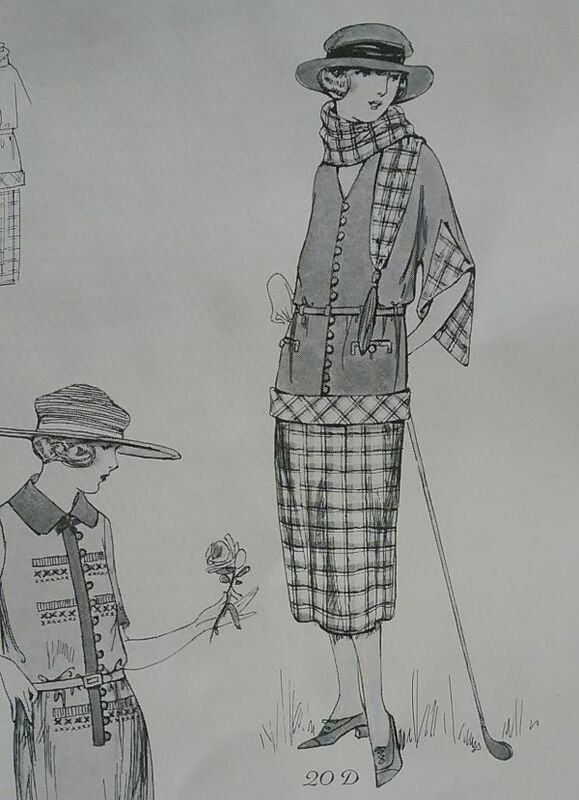 Bathing suit was part of the International Set line from Jantzen; hat by John Fredericks; copyright Conde Nast. I somehow usually manage to limit any vintage purchases to clothing items for my collection or to print resources that might aid in research. 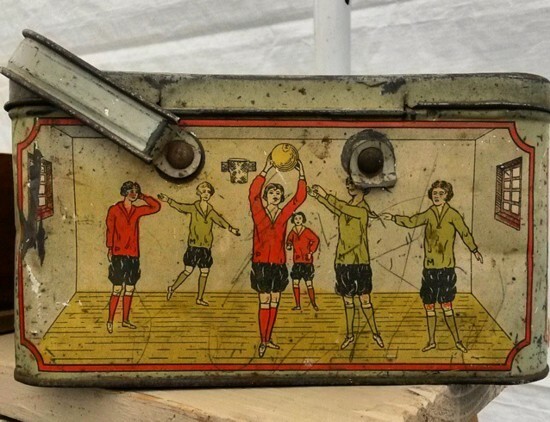 But sometimes an object so perfect that completely encapsulates my interests presents itself, and so it becomes part of my “archive.” In this case it is this 1920s tin lunchbox. That may seem to be an odd object to add to a vintage clothing collection, but with a theme this perfect, how could I say no. 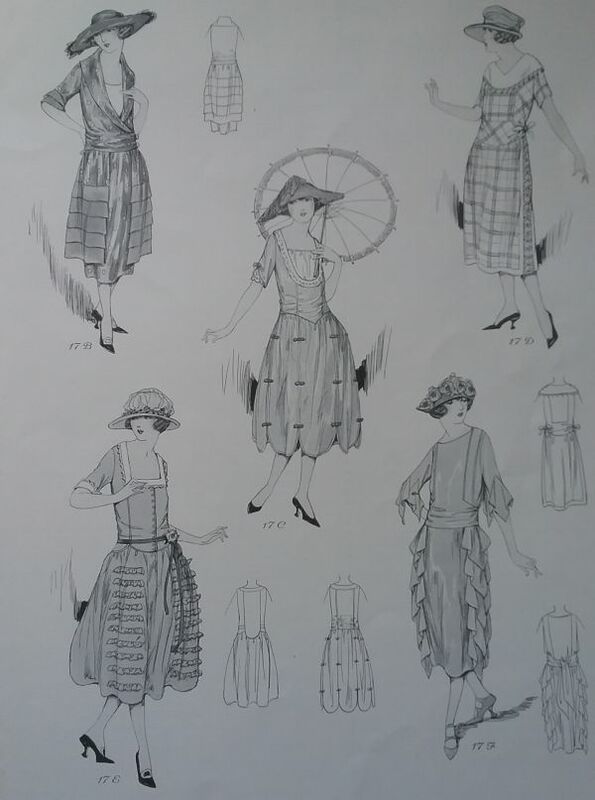 As the vendor put it, “I’ve never seen so much 1920s girl power on one item.” Neither had I. For I’ve seen a lot of sports-themed decorated items that were designed for teenagers, but the great majority of them were geared toward boys. There might sometimes be a token girl, cheering her boyfriend football hero from the sidelines, or maybe a shapely teen in a swimsuit, but the baseball player, the golfer, the racing driver would all be male. The graphics on my new box put the girls front and center, and put boys in a secondary role. This is obviously an item designed for girls, but it has none of the pink-tinged soft Hello Kitty motifs of products that are designed for girls today. These are real girls who enjoy sports. They are not portrayed as masculine girls, but they are shown to be strong girl competitors. They are not trying to be boys, but are enjoying the freedoms given to girls in the twentieth century. Interestingly, it was this generation of American girls who came of age in the 1920s that was the first to grow up knowing they would have the right to vote. * Girls were growing up better educated and knowing they had opportunities that had been denied their mothers. I’ve been reading a book written for teenagers about the battle for women’s right to vote, Petticoat Politics, by Doris Faber, published in 1967. It was the type of book that I loved as a girl. It showed that our rights were gained by hard work and perseverance. I’m somewhat perplexed by young women today who claim they are not feminists. But I think it is because they do not have a strong understanding of the history of women’s rights and because they mistakenly think that to be feminist is to be anti-male. Maybe they should look to the young women on my tin box as role models. Just because there are no boys at the swimming hole does not mean that they can’t look cute. Not only can she drive the race car, she can do it in style. This independent girl finished her needlework pillow and promptly took it for a spin in her canoe. Presenting the most non-aggressive basketball players ever! * Some states, starting with Wyoming in 1869, had already written into state law the right of women to vote. There was nothing in the US Constitution that did not allow women to vote, as voting rules were left up to each state. By the time the 19th Amendment was passed in 1920, most women living in the West already had the vote. With the passage of the 19th amendment all states were required to allow women to vote. I’ve been wanting a good snow, but since nature has not provided me with one, I’ve had to rely on the snows of Instagram friends and those of vintage illustrations. This one from 1945 is a favorite. 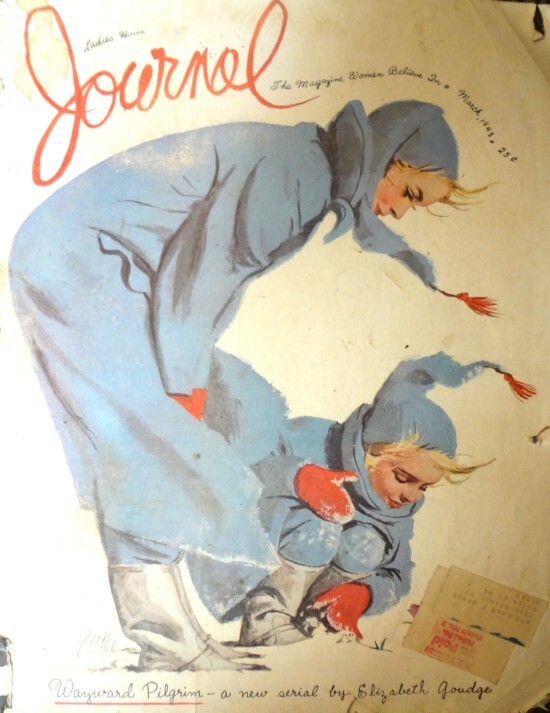 I love the icy blue of the matching mother-daughter outfits along with the touches of red in the gloves and tassels (and cheeks and lettering). Even their wind-blown blond hair matches. I love vintage fashion magazines, and one of the things I love the most is the cover art. 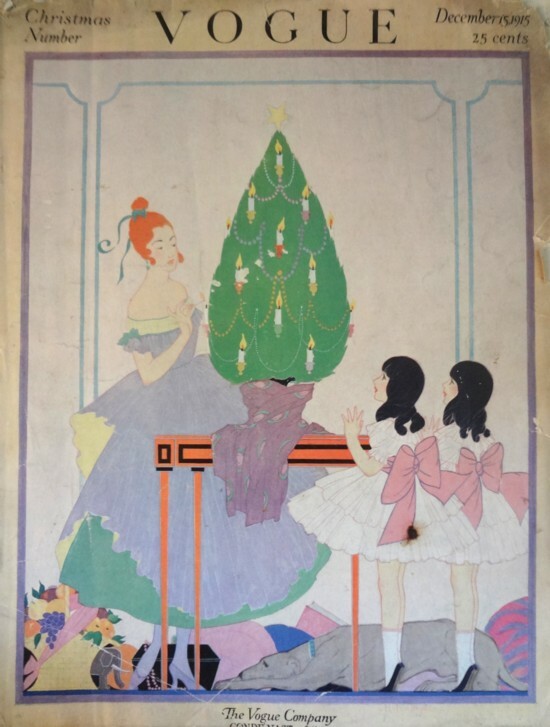 From the 1910 and into the 1930s, covers were illustrations instead of photographs, with some of the best commercial artists of the times working for Harper’s Bazar, Vogue, and other fashion and women’s magazines. The illustration above is by artist Helen Dryden who did many covers and inside illustrations for Vogue during the 1910s and early 1920s. Dryden had been trained as a landscape artist, but gave it up for fashion and Conde Nast. Later in life she turned to industrial design and worked designing decorative objects for the home, as well as car interiors. But it is for images like the one here that Dryden is best remembered. I love how the focus is on the lighting of the tree, even though there is a nod to the more commercial aspect of Christmas as you can see in the gifts scattered on the floor, in the background really. But my favorite part is the dog, a feature that is not immediately noticed, but which adds so much to the feeling of the picture. Contrast this 1915 cover with that of the 2014 December Vogue. It is a photograph of the celebrity of the month, Amy Adams, wearing a sheer Valentino couture dress. Out of the five headlines on the cover, three of them are about celebrities, including Kendell Jenner of the family formerly scorned by Anna Wintour (the Kardashian/Jenners), but now being praised to the hilt for their selling power. To some degree Vogue has been about celebrity since it was first published in 1892. This 1915 issue has article on the Ballet Russes, a feature on the latest stars in the theater, and photos of the latest society brides. But the great majority of the editorial pages are all about fashion, exactly what one might hope to find in a fashion magazine.